1. Peel and cut the potatoes into quarters. Cover and steam the potatoes until very tender, using a steamer saucepan or a bamboo steamer basket, over boiling water. It will take around 15 minutes. 2. Meanwhile heat a large shallow pan over medium heat. Add the olive oil, onion and garlic. Season well with S&P. Cook, stirring until onion is very soft. Add the oregano and thyme and combine. 3. Add the tomato passata and sugar then season well with S&P. Stir through the grated parmesan. Bring to the boil, then reduce heat and cook gently for 5-10 minutes. Add the basil leaves. Stir through a little water along the way if it gets too thick. 4. When potatoes are tender remove from the heat and pour out the water from the saucepan below. Place the potatoes back over the empty saucepan, uncovered, to “dry” for a few minutes. 5. Place the potatoes into a large bowl and mash with the potato masher until smooth. Add the nutmeg and season very generously with S&P. Mix the egg through the potatoes. 7. Form the dough into a ball. Cut the ball into even quarters. Roll each quarter into long lengths about 30 cm long and 2cm in diameter. Cut the lengths into 2cm pieces. Use the back of a fork to gently squash the pieces to make a lined indentation. 8. Cook the gnocchi in a large pot of salted boiling water in 2-3 batches. Cook each batch for a few minutes until it rises to the surface. Scoop out gently with a slotted spoon and place onto a plate. Then repeat until all gnocchi is cooked. 9. Add gnocchi directly to the warmed sauce and stir through gently. Be careful not to break the gnocchi up. 10. Serve with some freshly shaved or grated parmesan and basil. 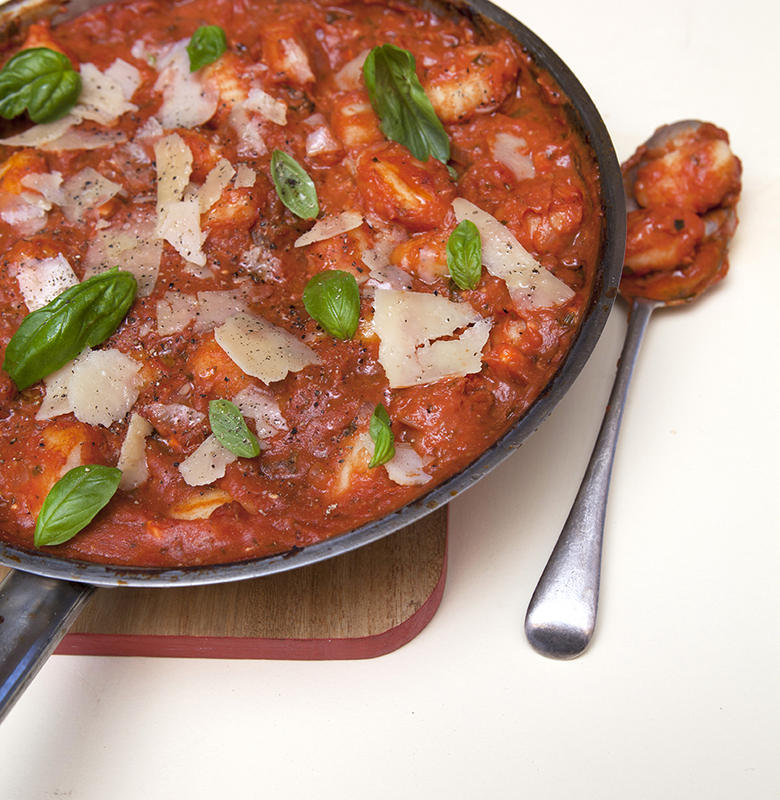 *Don’t overwork or overknead the dough as this will result in rubbery gnocchi. Once it has come together and is smooth you are ready to roll.